The $ 99 Koubachi Wi-Fi plant monitor pokes into the soil and uploads environmental data to the company, which then sends plant-care alerts customized for each species. If you’re the kind of person who worries about Frank the Fern and Gertrude the Geranium while you’re on vacation, a $ 99 cloud-connected plant monitor could be just the thing for you. The Koubachi device monitors soil moisture, temperature, and light. That’s what start-up Koubachi started selling in May and was showing off here at the IFA consumer-electronics show here. The white, waterproof devices monitor soil moisture, light, and temperature, said David Kurman, head of marketing and sales. The white, waterproof device has an ellipsoidal bulb perched atop a spike to poke into the plant’s soil. A built-in Wi-Fi module uploads the data, then Koubachi’s service examines it and sends alerts to the customer if it’s too hot or if the plant needs to be watered. “For every plant we have an individual model done by biologists at a university,” he said, because a ficus and an orchid have different needs. Of course, that also means you’ll need more one monitor for each different plant. Who’s it for? “People who like plants but don’t have a green finger, or people who don’t like tedious plant care,” Kurman said. Koubachi’s service keeps a week-long running record so people can see what’s happened recently; people can check their plants’ status through the Web or an iOS app. The company began selling its remote monitors in May, and three weeks ago made a significant change: the publication of data and alerts through an application programming interface (API). That in theory could enable somebody to build a robotic system that would, for example, add water or twiddle the thermostat as conditions warrant. The service is for people who want plants but who lack a green thumb, but the company is also considering corporate services to ease the burden on facilities maintenance staff, Kurman added. 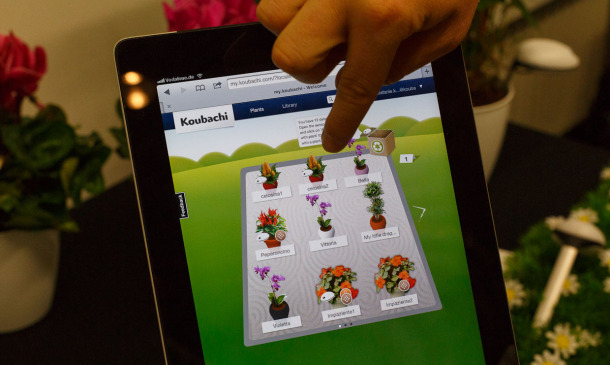 Koubachi’s iOS app lets people monitor a collection of plants. There’s also a Web interface. Koubachi’s iOS app shows a week’s worth of data about a plant’s temperature, light, and moisture.